Moderna has yet to spell out how much it would set aside toward any of several purposes outlined in its S-1 registration statement, filed late Friday. The company also did not specify how much in net proceeds it expected to generate, which would depend on how much money the company agrees to raise in the IPO. “As we unlock the inherent advantages of mRNA, we aim to address as many diseases and impact as many patients as our technology, talent, and capital permit,” Moderna stated in the S-1 filing. Funding drug discovery and clinical development, and further expanding its manufacturing platform, capabilities, and infrastructure to support its pipeline. Funding further development of its mRNA technology platform and the creation of new modalities. Funding working capital and other general corporate purposes. “We may also use a portion of the net proceeds to in-license, acquire, or invest in complementary businesses or technologies to continue to build our pipeline, research, and development capabilities and our intellectual property position, although we currently have no agreements, commitments, or understandings with respect to any such transaction,” Moderna added. Furthest along in clinical development is AZD8601, a localized regenerative therapeutic for vascular endothelial growth factor VEGF-A that is being led through clinical development by AstraZeneca. VEGF-A advanced to a Phase II trial earlier this year. Moderna and AstraZeneca are co-developing mRNA therapeutics under an up-to-$420-million-plus collaboration launched in 2013. The modality with the largest number of candidates (nine) is prophylactic vaccines, of which seven have Phase I trials ongoing or completed, according to Moderna: RSV vaccine (mRNA-1777), CMV vaccine (mRNA-1647), hMPV+PIV3 vaccine (mRNA-1653), H10N8 vaccine (mRNA-1440), H7N9 vaccine (mRNA-1851), Zika vaccine (mRNA-1325), and Chikungunya vaccine (mRNA-1388). The other two programs in the modality are in preclinical phases: Zika vaccine (mRNA-1893) and VZV vaccine mRNA-1278. Three other modalities have three candidates each. The systemic secreted therapeutics modality consists of an open-IND antibody against Chikungunya virus (mRNA-1944), and two preclinical programs, Relaxin (AZD7970), and Fabry disease (mRNA-3630). The antibody against Chikungunya virus development candidate is in collaboration with the Defense Advanced Research Projects Agency (DARPA), while the Relaxin program is with AstraZeneca, and the Fabry program is wholly-owned. The Intratumoral immuno-oncology modality includes a Phase I development candidate targeting OX40L (mRNA-2416), an open IND candidate targeting OX40L+IL23+IL36g (mRNA-2752), and a preclinical candidate targeting IL12 (MEDI1191) being developed with AstraZeneca. The three candidates in the systemic intracellular therapeutics modality are all preclinical: MMA (mRNA-3704), PA (mRNA-3927), and PKU (mRNA-3283). Moderna’s sixth modality is cancer vaccines, of which two candidates are in development by the company with Merck & Co.—the Phase I personalized cancer vaccine, or PCV, (mRNA-4157) and the open-IND KRAS vaccine (mRNA-5671). 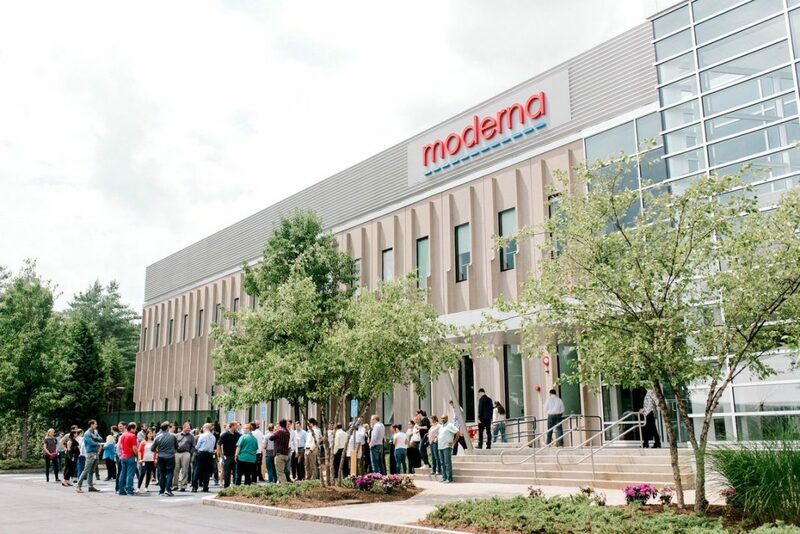 Moderna bolstered its manufacturing capabilities in July when it opened a 200,000-square-foot cGMP clinical development manufacturing plant in Norwood, MA. The plant was intended to give the company the capacity to develop materials for preclinical toxicology studies as well as Phase I and II clinical development programs, as well as to manufacture, test, and run fill/finish operations for its portfolio of mRNA development candidates. The facility also houses the company’s PCV Unit for individualized supply batches of mRNA for potential personalized cancer vaccines. “We built and continue to invest in a platform to advance the technological frontier of mRNA medicines,” Moderna added. “We made and continue to make forward investments in scalable infrastructure and capabilities to pursue a pipeline of potential medicines that reflect the breadth of the mRNA opportunity.